Northern gardeners enjoy some of the Southern flowers, while others are available only to the gardeners in the South. Southern flowers exhibit special qualities--taking on the heat of the summer, standing up to attacks from salt water and being adaptable to dry conditions--that come in handy in other parts of the country as well. Beach sunflower (Helianthus debilis) is a member of the daisy family and is hardy in USDA zones 8 to 11. The plant comes as a tall variety growing from 3 to 4 feet tall or as a low-growing, spreading variety growing up to 18 inches tall. Both varieties feature course-feeling, heart-shaped leaves measuring from 2 to 4 inches long and about 4 to 8 inches wide at the widest point. Flowers are comprised of numerous yellow rays or petals up to 1 inch long surrounding a red-purple center disk 1 inch in diameter. Use as a ground cover or to help with sand erosion. Butterflies will come for a drink of the nectar. The plant is both salt and drought tolerant. Plant beach sunflower in full sun and a dry soil. Standing cypress (Ipomopsis rubra) grows from 2 to 5 feet tall and 1 1/2 to 2 feet wide. The plant is a biennial, producing only leaves the first year with flowers blooming the second. The original plant will die after the second year, but new ones will start the cycle again. Red-yellow, tube-shaped flowers bloom in June through August growing in clusters at the top of the stems. Delicate, featherlike leaves grow up to 1 inch long. Plant standing cypress in full sun and a soil that is dry to medium-moist and well-drained. The plant is hardy in USDA zones 6 to 9. Wild azalea (Rhododendron canescens) is a deciduous shrub growing from 6 to 15 feet tall with a similar width. Fragrant pink, dark pink or white tube-shaped flowers 2 to 3 inches long bloom in early spring on the ends of the stems coinciding with the appearance of the leaves. Plant wild azalea in an acidic, organically rich, moist soil and in full sun, partial shade or full shade. The plant is hardy in USDA zones 6 to 9. Brown-eyed Susan (Rudbeckia triloba) is a biennial hardy in USDA zones 4 to 8. The plant grows from 2 to 3 feet tall and 1 to 1 1/2 feet wide. Flowers with yellow petals and brown-purple center disks bloom from July through October. 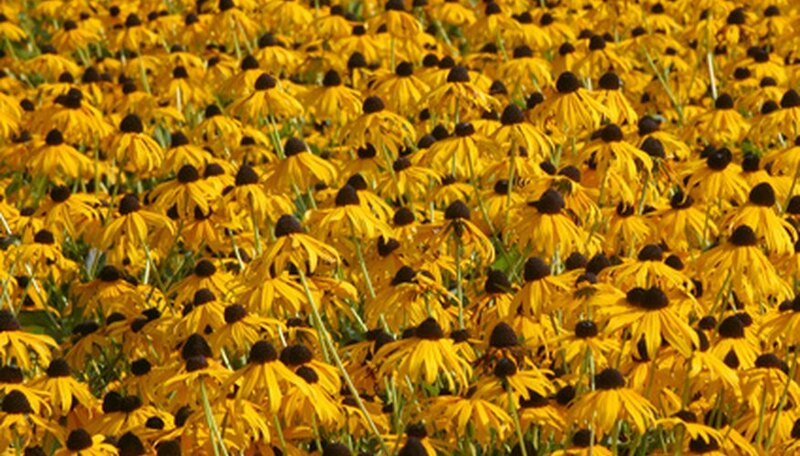 Plant brown-eyed Susan in full sun and a moist, well-drained soil. The plant grows from 2 to 3 feet tall. Egg-shaped leaves grow on the lower parts of the plant and longer leaves at the top.